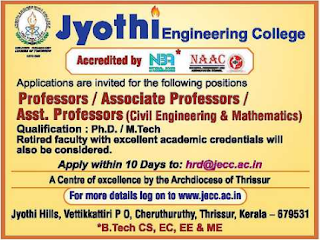 Jyothi Engineering College Recruitment 2019 for Professor/Associate Professor/Assistant Professor. 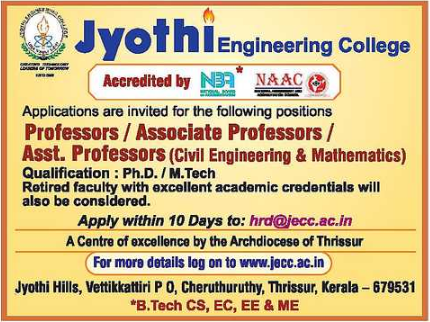 Jyothi Engineering College Jobs 2019. Eligible Aspirants can send to college email id are given below. More information about Jyothi Engineering College (2019), including number of vacancies, eligibility criteria, Salary, selection procedure, how to apply and important dates, are maintained below. Starting date to apply for Jyothi Engineering College Assistant Professor Jobs : within 10 days from the notification date. Interested candidates can send to college email id are given below.